Posted in DIY, Fun	by C.
The older and wiser (fingers crossed on the wiser aspect) I get, the more I appreciate real-live natural beauty. One of the smallest pleasures I like to give myself are a quick homemade vase of flowers. I truly share the sentiment that having a simple bouquet can instantly change your mood every time you walk into a space or even glance in its direction. It’s a great way to energize your home or your desk at work as you scowl at all those urgent-marked (but not really that urgent in reality) emails. I recently found a new web series from Lauren Conrad, who seems to be trying to dethrone Martha Stewart herself with these DIY craft-based videos. Goodness, has she come a long way from “The Hills.” This girl is in the thrust of building an empire. More power to her! My home not only looked and smelled better; but I got to entertain my crafty side by using a different object as a vase, which I usually use in my pantry to store packets of tea bags. It took a good 10 minutes to tape the grid, then cut and rearrange the flowers to my liking. The beauty of making arrangements is that you can use any type of flower or any object as a vase. I’ve been seeing lots of creativity with using teacups, pitchers, and mason jars as a holder for a blooming bouquet.The sky really is the limit. More posts to come as I continue to explore my floral making side. Beautiful flower arrangements! 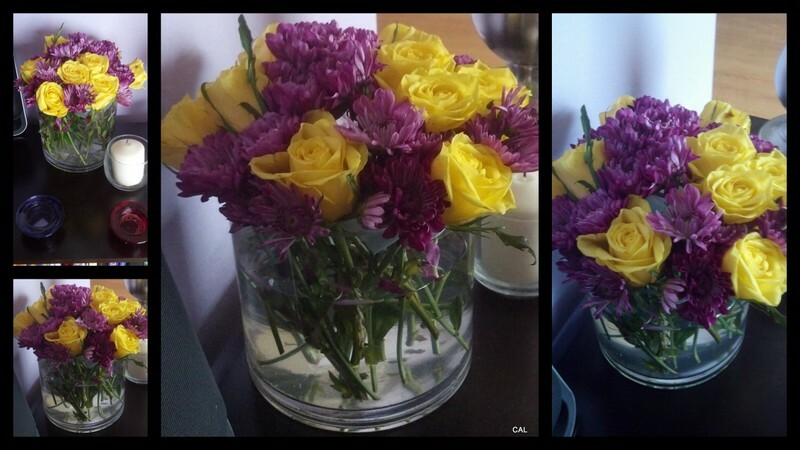 Such a “small” thing as flowers can really work magic to the feeling at home!